South Gyeongsang Province (Korean: 경상남도, translit. Gyeongsangnam-do, Korean pronunciation: [kjʌŋ.saŋ.nam.do]) is a province in the southeast of South Korea. The provincial capital is at Changwon. It is adjacent to the major metropolitan center and port of Busan. There is UNESCO World Heritage Site Haeinsa, a Buddhist temple that houses the Tripitaka Koreana and attracts many tourists. Automobile and petrochemical factories are largely concentrated along the southern part of the province, extending from Ulsan through Busan, Changwon, and Jinju. The name derives from Korean Gyeongsang, meaning 'joyous furthermore'; from gyeong (Korean 경, Hanja 慶)​, meaning 'happy', and sang (Korean 상, Hanja 尚)​, meaning 'still more'. The name derives from the names of the principal cities of Gyeongju (경주; 慶州) and Sangju (상주; 尙州). Before 1895, the area corresponding to modern-day Gyeongsangnam-do was part of Gyeongsang Province, one of the Eight Provinces of Korea during the Joseon Dynasty. In 1895, southern Gyeongsang was replaced by the districts of Jinju in the west and Dongnae (modern-day Busan) in the east. In 1896, they were merged to form Gyeongsangnam-do. The provincial capital was originally at Jinju; it moved in 1925 to Busan. In 1948, Gyeongsangnam-do became part of South Korea. In 1963, Busan separated from Gyeongsangnam-do to become a Directly Governed City (Jikhalsi). In 1983, the provincial capital moved from Busan to Changwon. In 1995, Busan became a Metropolitan City (Gwangyeoksi), and Ulsan separated from Gyeongsangnam-do to become a Metropolitan City in 1997. The province is part of the Yeongnam region, on the north by Gyeongsangbuk-do province, on the west Jeollabuk-do and Jeollanam-do provinces, and on the south by the Korea Strait far from Japan (Nagasaki Prefecture). Most of the province is drained by the Nakdong River and its tributaries. The total area of the province is 10,533 square kilometres (4,067 sq mi). The Nakdong delta plain around Gimhae is one of the best granaries in South Korea. Agricultural products form Gyeongsangnam-do include rice, beans, potatoes, and barley. The area is renowned for its cotton, sesame, and fruits which are grown along the southern seaside. A number of marine products are caught. The province is one of the country's leading fisheries. The largest cities in the region are Busan and Ulsan, which are separately administered as provincial-level Metropolitan Cities. Apart from the capital Changwon, other large or notable cities include Gimhae and Jinju. Gyeongsangnam-do is the home of Haeinsa, a Buddhist temple that houses the Tripitaka Koreana and attracts many tourists. It is in the national park around Jirisan (1,915 m) on the border with Jeollabuk-do. The temple was first built in 802. Changnyeong county contains three major tourist attractions for the province: Upo wetland, Bugok natural hotsprings, and Hwawang mountain. Gyeongsangnam-do is divided into 8 cities (si) and 10 counties (gun). The names below are given in English, hangul, and hanja. 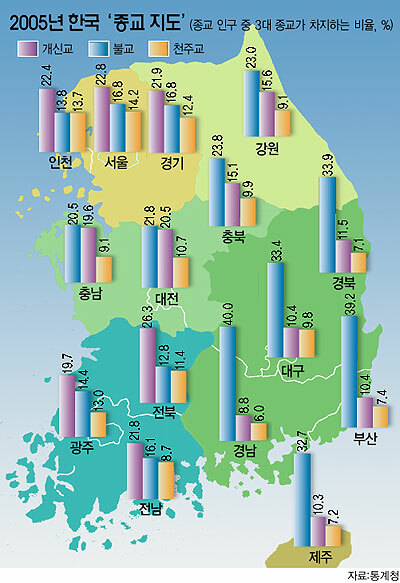 According to the census of 2005, of the people of South Gyeongsang 40% follow Buddhism and 14.8% follow Christianity (8.8% Protestantism and 6% Catholicism). 45.2% of the population is mostly not religious or follow Muism and other indigenous religions. ^ 일반 현황 (in Korean). South Gyeongsang Province. Retrieved 18 March 2013. ^ "Population of Gyeongsangnam-do" (in Korean). Gyeongsangnam-do. Archived from the original on 2014-02-25. Retrieved 2013-07-16. Wikimedia Commons has media related to Gyeongsangnam-do.